Can Audi/Volkswagen ruin your Credit History? Yes They Will Try! After going throw two lemon law hearing where the BBB and Texas DOT said my Audi TT was not a lemon. I stopped paying on the car and purchase another car before Volkswagen ruin my credit. This tactic was very expensive and unnecessary I found out later. to get their money back. This is Fraud! 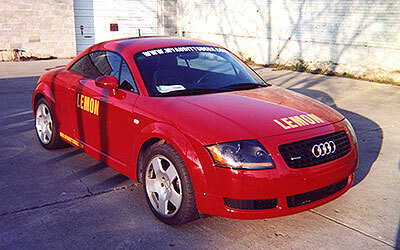 I would never swindle anyone looking to buy a new car and sale them a Audi/Volkswagen lemon. The lemon law trials were bogus, and the number of invoice repairs, mint nothing to the BBB and Texas DOT Judge/Arbitrator. Guess who looked at the number of invoice repairs and basically said the car was a lemon? I sent the Credit Bureaus a copy of all the invoice repairs and hearing information. The Credit Bureaus simply remove Volkswagen off my Credit history. Volkswagen cant force you to make payments on a defective car/lemon. My invoice showed that I kept paying on the Audi TT lemon and I gave Audi/Volkswagen several times to fixs the car problems that they couldnt fixs. You should also send the Credit Bureaus a link to any recall you find on the Internet. Note: Company like Audi will not inform you about their recalls. You have to find them. 2. The four-time test for the car to be called a lemon. Play it safe by taking it in six times. 3. Show a record that you never stopped paying on the car. Up to the last bogus repair. Im constantly asked about the Audi warranty. A warranty will do you no good if; every time Audi/Volkswagen says the car its fixed when you get it back. Audi said my car was fixed over and over. anything about Audi/Volkswagen giving you your money back or replacing the Audi with another one.